Lombok is one of those islands that are literally covered in beaches. And while you might think that there are too many for comfort, most tourists visit a number of landmarks when in Lombok – same goes for the beaches. Say, the Mawi Beach that I want to discuss with you today is minutes away from Semeti. Telawas, Munah, Selong Belanak – those are just some of the beaches that sit on the same coastline. So, if you get tired of this spot, don’t be afraid to take your things and walk up or down the shore. That way, you’ll get to see not one, but several beautiful places on the island and turn your otherwise boring trip into an exciting adventure. And while there are some fees for parking and/or entering a certain tourist spot, they are very small and won’t affect your budget. The Mawi Beach faces the Indian Ocean and offers some magnificent views. The fans of selfies will, without a doubt, appreciate the breath-taking scenery. The locals really love this beach and often visit it with families to rest after a hard day at work. Located in the beautiful Mekarsari village, it’s only 12 kilometers away from the world-famous Kuta and won’t take you a long time to go from point A to point B. The Mawi Beach is considered to be one of the most popular tourist spots on the island and has everything a foreigner could ever need. If you’re a fan of surfing and would really love to check your skills on some steep waves, this place will be perfect for that. Surfers from all over the world love Lombok for the incredible mix of calm, moderate, and “angry” waves. However, the beginners will probably have no luck curbing the water). At the bottom of the crystal-clear sea, you’ll find rocks, corals, and everything else in between. Now, the rest of us (people that don’t really like water activities that much) will also get to have a lot of fun. The Mawi Beach offers jaw-droppingly beautiful views that will linger on long after you leave the island. The sand is white and feels amazing under your feet. The hills turn the landscape into something heavenly, and during the dry season, the entire place looks like a tiny piece of paradise. The May-October period is officially the best time to visit. That’s when you’ll get to enjoy the beach the most. Now, even though this spot is becoming more and more popular, the infrastructure is still weak and you won’t find any decent hotels/guest rooms in the area. Luckily, as I mentioned earlier, the Kuta beach is not that far away, and you’re more than welcome to rent a room there and travel to the Mawi Beach only after you have a nice meal at one of the restaurants/cafes in Kuta. The locals are nice people – very friendly and helpful. However, there are always some shady individuals at the popular spots, waiting for the right time to rob the tourists. So, if you’re planning on swimming or surfing, make sure there’s someone to guard your personal belongings. Or, better yet, leave it all at the hotel. I was robbed once in Lombok already and am not going to make the mistake of leaving it all out in the open again. I highly encourage you to do the same. Other than that, life flows smoothly on the island and the Mawi Beach has the ability to magically get every single person “in sync” with the rest of the crowd. Many tourists like to rent boats and/or pay for boat trips around the island. You can do that here. As always, the boat owners will try to charge you double. Even if you know how to bargain, the language barrier between you two will probably prevent you from dropping the price. In any case, Lombok is one of the cheapest resort islands in the world. So, yes, you might end up spending a lot more than you could have; yet, you’ll still get to save a significant amount of money because of the incredibly low cost of the hotel rooms, the service, the restaurants, the tickets, and more. Lombok is cheap; at the same time, it looks and feels like an elite resort island. Just Another Tourist Spot, Or A Dreamlike Beach? We already learned that the surfers will love this place because of the strong waves. The turquoise water looks amazing and is great for taking a swim and getting “refreshed.” The canabas are awesome; you can sit and even lie there and relax while hiding from the burning sun. I know I said earlier that there are no proper hotels in the vicinity, and that’s still true. But there are a couple of stalls that sell coconut juice and corn, along with some snacks. You won’t be able to fully satisfy your hunger with snacks – that is why people go to Kuta. The Mawi Beach is perfect for some ball games, including volleyball, football, tennis, and more.The incredibly tall waves, along with the clean, picturesque beach, make this spot a wonderful training ground for the pro surfers. Remember: you’ll have to bring your own gear. They say that the road to this beach is a big challenge, but the ones that overcome all the obstacles and get there are rewarded with a wonderful experience. For example, the path to Kuta is much more comfortable. I said earlier that the locals love to visit the Mawi Beach with their kids; I have to also mention that for the foreign families, this place won’t be that good, as there’s almost no entertainment for children and usually only the fans of water activities visit this place. At the end of the day, you’ll be happy with the Mawi Beach if you’re traveling alone and are looking for that tropical island experience. The surfers, in turn, will have an awesome time there and recommend it to their friends. For sunbathing, swimming and chilling, it’s also quite alright. The tides will wash up some trash here and there, but overall, this is one of the cleanest spots in Lombok. Arrival is difficult and you might have to ask the locals for guidance. Parking is easy, though, and you can almost feel how the advanced infrastructure of Kuta is slowly, but steadily moving to the left, turning the Mawi Beach into another well-developed tourist magnet. Once you end up in Kuta, follow the main road and turn as soon as you see the sign signaling that you’re getting close to your destination. From that moment on, the path will become extremely bumpy. The fans of adventures in foreign islands will love this part. Others will probably swear a lot. The potholes will welcome you on every step of the way. But the experienced drivers of Lombok know every single bump by heart and will get you to the Mawi Beach better than the finest Formula 1 racers. This part of the road is best to overcome on a scooter or a bike. It will be much harder to do everything right behind the wheel of a car. At the spot, the atmosphere is very friendly and warm, which makes the tourists feel like they belong there. I can’t really speak Sasak that well but still managed to make a couple of friends. If you’re traveling with your girlfriend, the romantic vibes of the Mawi Beach will be ideal for an unforgettable evening. Diving is not an option. Surfing is incredible. Everything else is on par with the best beaches in Lombok. The fastest route from the Lombok Airport to our destination will take less than an hour and is 26 kilometers strong. It’s mostly straight and you’ll be perfectly fine on a rented car/bike (that last part will still be a challenge, though). But if you decide to take the longer route and drive through Kuta, that will take you 1 hour 15 minutes, or more. 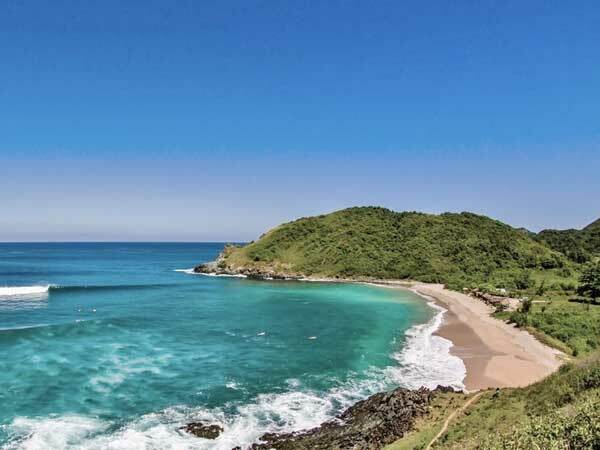 It’s well worth it, though, as you’ll get to do some sightseeing and check out the famous Kuta village and beach. In any case, drive safe and don’t ever get behind the wheel if you’re feeling tired. Hire a taxi driver: the locals know the island better than anyone and will get you there in the blink of an eye. Note: don’t rely on Google Maps, because there’s no Internet coverage on this beach. In Kuta, you’ll be able to get a signal. Save the map there and only then drive to Mawi. For the regular tourist, this is just another beach in the middle of nowhere. But for the surfers, it really is Heaven on Earth. The roads weren't in a horrible condition when we arrived. Maybe they had some time to fix them, or maybe it was just because of the dry season? For a beach that's supposed to be surfers-only, it's pretty damn awesome. Besides, watching the pros do their thing is exciting. We had a good time there. The neighboring beaches are almost the same, even though there aren't as many surfers there. Initially, we were planning on staying in Kuta for the entire trip. It was one of our local friends that recommended this beach. We love it now!